Since we brought Facebook Platform to mobile last year, Facebook’s mobile users have been able to access many of their favorite Facebook apps and games from their smartphones. Developers of mobile apps have embraced the platform for social discovery and are starting to benefit from the distribution it brings. Four months later, Facebook has 425 million monthly mobile users - and the platform sends more than 60 million visitors every month to apps and games. Mobile visitors were responsible for more than 320 million visits to mobile apps last month. 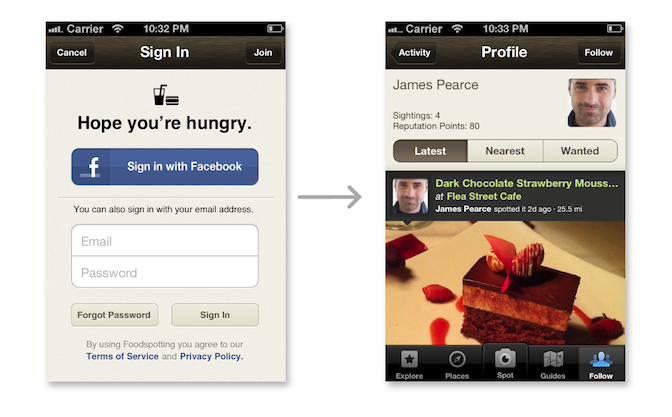 On many of today’s mobile platforms, distribution is often a function of ranking and position in curated app stores. While this benefits established apps and that are editorially featured, for the majority of developers, getting an app discovered can present a real challenge. The power of social distribution, however, is to help great apps and games reach new users naturally. Apps benefit from the re-engagement that these social channels bring, with users easily encouraged to return to an app when their friends use it, share activity, or compete in social games, for example. We have seen a rapid increase in visits for many types of apps and games using our social distribution channels - News Feed, bookmarks, requests and so on - a growth that is evident across both native and web apps. BranchOut, for example, a social-professional networking web app, sees more than 350 thousand visitors from Facebook mobile every day. This traffic has already grown by a factor of twenty since the start of the year. And Diamond Dash, a native iOS game by Berlin based developer Wooga, sees more than 1.9 million monthly visitors to their mobile app from Facebook. Daily traffic sent from Facebook mobile grew by a factor of three since they integrated with Facebook Platform and implemented Single Sign On. In addition to sharing their experiences, people also turn to their mobile devices to consume content and stay current with what's happening around them. News and music apps are also popular examples. 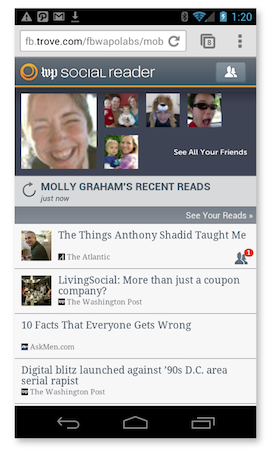 The Washington Post Social Reader is a news reader designed around the reading activity of a user and their friends. Using Open Graph, the app can personalize the content that is presented, share what users have read on their Timeline, and improve discovery. Across mobile and web, the Social Reader has benefitted greatly from Open Graph, receiving more than 10 million visitors from Facebook every month, and beating its launch targets fivefold. 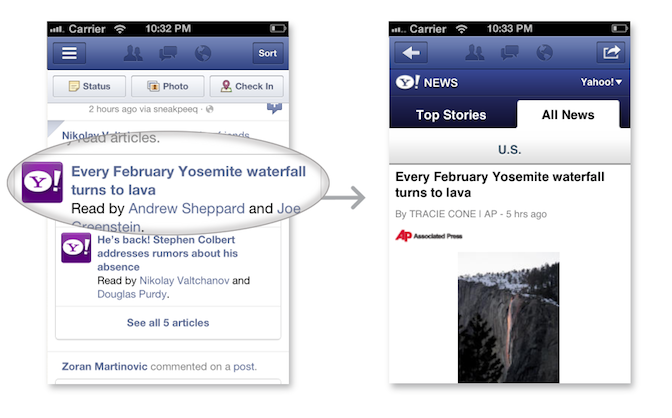 A final example, Yahoo!, recently implemented Open Graph with their desktop Facebook app, which also sends traffic to their mobile web app. Traffic to the mobile Yahoo! News web app from Facebook Mobile has increased three-and-a-half times since February 14th, to 1.6 million visitors a day. All of these examples show that simple usage of Facebook Platform features like Single Sign On and Open Graph - together with the reach of Facebook's social channels - can dramatically increase the uptake, usage, and re-engagement for mobile apps, regardless of platform. We encourage you to explore these opportunities for your own apps. To learn more about growing your app with Facebook Platform, check out our mobile Getting Started Guide. To learn about Open Graph check out our Best Practices section. And to stay on top of everything that's important in mobile for Facebook developers, please Like our new Mobile Platform Developers Page.